Do Stop-Start Systems Really Save Fuel? To answer the last question in our 4-part series “Does the Idle Stop & Go System Really Work?”, Gateway Kia Quakertown PA service department describes the technology behind a stop-start system. Accordingly, to save fuel the ISG (Idle Stop & Go) system automatically shuts down the engine when the vehicle is idle for a period of time. Then, it restarts the engine automatically when the driver performs certain actions. The concept is hard to dispute because an engine doesn’t burn gasoline when it’s shut down. This technology began with hybrids. At lower driving speeds, the hybrid electric motor engages and the gas engine disengages. Since the early days, systems that developed into the Idle Stop & Go have been installed in nearly every type of vehicle -including heavy trucks and vans. But the theory has yet to sink-in with motorists, they still question whether there’s a fuel saving. The reason for their questions stems from a popular belief that starting the engine uses more fuel than the engine uses at idle. Logically, repeated starts will burn more fuel. Kia Quakertown PA service department says this is true, but only under one condition, starting the engine from a cold start. When cold, the engine will consume more fuel because the onboard computer is programmed to richen the fuel mix. A richer mix burns hotter and warms the engine faster when the outside temperature is cold. Now, if the “Idle Stop & Go” system does save on fuel costs, the big questions are how much does it save and is the option worth it? First, as we explained in the previous section of this article, the Idle Stop & Go system deactivates under certain conditions. One of those conditions is when the engine is cold, so the ISG system does not repeatedly start a cold engine, it only engages after the engine is warm. Accordingly, Kia’s Idle Stop & Go system only stops and starts warm engines. The majority of drivers believe the amount of savings from the ISG system is minute, but,, when you repeatedly save something small, it adds up quickly -like putting loose change in a jar. The engineers who developed these ISG systems report potential fuel savings in the range of 3-12 percent. The extended span from 3 to 12 percent accounts for the diverse driving styles and conditions. For example, motorists who briefly stop at stop signs see fewer savings than those who sit idle at long stop signals. Remember, the longer the vehicle sits, the more fuel saved when the ISG engages. Using the above points, if your vehicle performs at 20 mpg in the city, there is a very good possibility the vehicle will perform at 22 or 23 mpg with an ISG system installed. However, the impatience that builds from waiting in traffic can undermine savings. While in stopped traffic, drivers tend to move forward at any opportunity, even if only by an inch. So, to keep the system engaged the driver should resist the temptation to inch forward when they see the car ahead inch forward. Inching along disengages the ISG system and it won’t re-engage until the vehicle passes a minimum speed threshold. Whenever possible, keep the car still until there’s enough distance between you and the car ahead so when you move, you can meet the minimum speed threshold. Overall, the Kia ISG (Idle Stop & Go) system has become more popular with Kia owners. Mainly because the feature offers the vehicle owner a level of accountability for contributing to reducing the use of fossil fuels and emissions that pollute the environment. 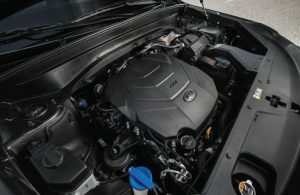 If you find these reasons beneficial and wish to see the ISG system in action, then stop by at Gateway Kia Quakertown PA and a Kia customer service representative will assist you. Does The Auto Stop-Start Drain The Battery? To answer the second question in our 4-part series “Does the Idle Stop & Go System Really Work?”, systems and features that drain the battery when the engine is shut down are lights, sound/entertainment systems, some temperature controlled options such as heated/cooled seats, the onboard computer, and of course, engaging the starter motor for starting the engine. Gateway Kia Quakertown PA service department technicians report that when the engine is not operating, the generator is not producing and delivering power to the electrical systems or battery. So when the engine is shut down only the battery transfers power to active systems or features. We know from the previous question that Gateway Kia Quakertown PA vehicles are installed with Idle Stop & Go systems, and they operate when the vehicle is in (D) Drive, the engine is at peak operating temperature (warm or hot), and at a stand-still idling. We also know the electrical system is powered by the engine. So, what happens to those systems when the engine is shut down or when the engine is repeatedly restarted? Gateway Kia Quakertown PA service department explains that normally, the average driver is using the infotainment systems or enjoying the air-condition or heater. And drivers are concerned that when the engine is shut down, those systems continue to operate and draw power from the battery. Also, restarting the vehicle places a heavier load on the battery when the engine doesn’t operate long enough for its systems to recharge the battery. Again, Kia technicians say not to worry. Kia vehicles are outfitted with heavy-duty components designed to endure the “Idle Stop & Go” system. All of Kia’s parts are reinforced for heavy workloads and designed to reduce servicing costs, especially the battery. Even though Kia’s batteries are designed especially for extended restarts, they’re not overloaded by electrical systems such as the infotainment and comfort systems. The “Idle Stop & Go” feature monitors a dozen conditions before shutting down the engine. This is to protect the battery from being weakened. For instance, if the outside ambient temperature is too high (hot) the system is programmed to disengage and the engine continues to circulate and control coolant temperature and air-conditioner. The programming for cold weather is similar but instead of air-conditioning, the engine runs the water pumps and heater blower motor to warm the interior. CLICK HERE FOR QUESTION #3: Do Stop-Start-Systems Really Save Fuel? Is The Auto-Stop Bad For The Engine or Starter Motor? The answer to this first question in our 4-part series “Does the Idle Stop & Go System Really Work?,” the auto-stop (Idle Stop & Go) feature DOES NOT harm the engine or starter motor. So, traveling from Allentown PA or from Gateway Kia Quakertown PA to Philadelphia, and familiar with sitting in Blue Route traffic, the Idle Stop & Go system is safe and unquestionably saves fuel. Let’s look at how this system works. Aside from the electrical systems and related components (battery, cables, etc. ), we focused on the starter motor and the engine. But because the starter motor cranks the engine from a dead stop, there is more demand placed on the starter motor. Engines are designed to withstand countless hours of operation under extreme conditions, but a starter motor has certain limitations. Gateway Kia Quakertown PA service technicians confirm the components installed in a standard starter motor are less resistant to extreme extended use. Their use is designed for traditional operation -to start the vehicle. Here’s a typical cycle- a driver engages the starter motor via the ignition, the starter motor cranks the engine, and when the ignition is released, the starter motor disengages to allow the engine to run on its own. Let’s say a typical starter motor is built to operate approximately 100,000 cycles, but when a vehicle is fitted with a stop-start system, the starter motor may be engaged for as many as 300,000 cycles. Three times the workload places an extra burden on bearings and electrical components inside the starter motor, which shortens the life of the motor. On the other hand, an issue that may burden the engine is temperature. In the past, we were taught to allow the engine a warm-up period before driving away. Also, traveling short distances under 10-15 minutes was bad for the engine because it never has the opportunity to warm up and circulate vital fluids before shutting down. Gateway Kia Quakertown PA service department technicians say not to worry. Kia vehicles are fitted with parts reinforced to withstand additional workloads for systems such as the “Idle Stop & Go.” In this case, heavier duty starter motors are installed. Also, the Kia ISG system only works when the engine is hot, so the cold winter Quakertown PA temperatures are not an issue. Kia’s standard policy is to install higher quality parts in all its vehicles to accommodate the different driving styles and situations between motorists. For example, someone traveling within the city of Philadelphia may use ISG technology more often than someone traveling within Quakertown PA. The city driver will definitely see more stop and start traffic than in Quakertown. So either way, Kia’s original equipment covers all drivers. CLICK HERE FOR QUESTION #2: Does The Auto Stop-Start Drain The Battery? Does The Idle Stop & Go (ISG) System Really Work? This four-part article discusses how in recent years, nearly every automotive manufacturer offers a technology that saves gas and reduces exhaust emissions. Kia named their version of this technology ISG. The acronym stands for Idle Stop & Go. Gateway Kia Quakertown PA service staff department explains that the ISG system was designed to automatically shut the engine down after the vehicle has been idling for a period of time. So, anyone traveling from Allentown PA or Quakertown PA to Philadelphia is familiar with getting stuck in traffic and idling on the Blue Route. This is where the ISG technology works best. But even though the tech is innovative and well-tested, motorists still have questions because their general knowledge about repeatedly stopping and starting the engine is bad. There’s a lot of information to cover within the answers of these three questions, so let’s break them down. Looking at the first question, the subject relates to the wear on engine parts, the next addresses battery drain caused by repeated starting, and the last question examines fuel consumption and emissions control. Before jumping into the answers, owners of a Gateway Kia Quakertown PA vehicle should know the primary operation of the ISG System. The seat belt is unfastened. The hood or a door is opened. The front or rear defroster is turned on. Engine coolant temperature is low. The outside ambient temperature is too high/low. The vehicle is on a steep slope. CLICK HERE FOR QUESTION #1: Is the Auto-Stop Bad for the Engine or Starter Motor? The three-row SUV market has a new competitor the 2020 Kia Telluride -this is our review. 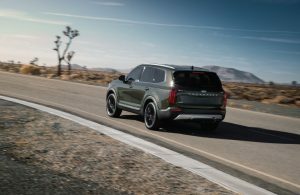 We were first informed last year that the Kia Telluride release date would be later this year, but surprise… the big, bold, and boxy luxury SUV is here in the US and soon to be displayed in February 2019 at Gateway Kia in Quakertown PA. 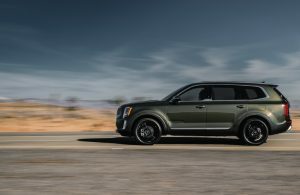 Since its September 2018 debut at Fashion Week, SUV shoppers have been flooding Kia dealers in PA with inquiries asking “when is the Kia Telluride coming out.” So, if you are in the market for an SUV, contact us to schedule a test drive in the 2020 Kia Telluride. As an automotive manufacturer, Kia has an excellent track record with more than several of its crossovers and SUVs. It is a company best known for producing fuel-efficient cars. 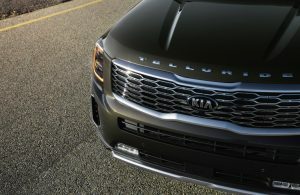 So, it’s not unreasonable critics believe the Telluride may be a step outside of Kia’s comfort zone. Nevertheless, venturing into the American mid and full-sized SUV market is a challenge for any manufacturer, even “The Big Three” car companies, General Motors, Ford, and Chrysler are challenged annually for leadership. And this year, they have their hands full with Kia’s new addition, the 2020 Telluride. That all sounds great right? Well, that’s not all! 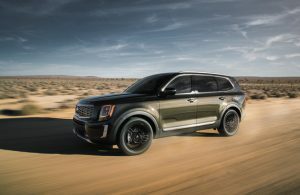 And, if you want to see the Telluride for yourself, schedule an appointment today with Gateway Kia in Quakertown PA because the answer to “when is the Kia Telluride coming out” is -this February 2019. Telluride is engineered as a proficient SUV offering an ability to handle variations of driving conditions. These variations contribute to the driving experience enjoyable by all and with total confidence. Some of the many options that giving rise to the Telluride’s ride and overall performance are an Atkinson Cycle LAMBDA II 3.8L V6 GDI engine, which produces 291 horsepower at 6,000 rpm and 262 lb.-ft. of torque at 5,200 rpm. A V6 powerhouse coupled to the 8-speed automatic transmission, delivering power through the front wheels (or all wheels) and a self-leveling rear suspension, makes the Telluride a formidable American market contender. Telluride will be available in four trims, LX, EX, S and SX with an option of front-wheel or all-wheel drive. We’ll go into more details at a later date after the Telluride arrives in our showroom. Again, if you’re wondering when is the Kia Telluride is coming out, it’s this February 2019. Contact us today for a premier viewing on our showroom floor! It’s said charity is the gift of life because the joy received from one’s sacrifice has no equal. 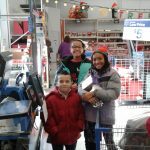 Gateway Kia in Quakertown and the YMCA understand this paradigm and collaborated on a Walmart Holiday Shopping Spree. So, whether it be the giving of one’s self in service or some object, the act of “subtracting from” for the purpose of “adding to” is the same. That notion may sound emotionless and cold and, but in its basic form, charity is giving for the purpose of helping. Below we’ve included a few quotes expressing that paradigm. ‘If I do not stop to help this man, what will happen to him? At the end of life, we will not be judged by how many diplomas we have received, how much money we have made, or how many great things we have done. We will be judged by, “when I was hungry, and you gave me something to eat… and when I was naked, you clothed me… and when I was homeless, you took me in. We all know there is no guidebook on being charitable. 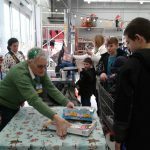 In fact, a charity may be achieved in many ways, such as an individual or organization can volunteer time at a local Food Bank to help distribute food to the hungry. Or, money may be donated to charitable organizations for helping people who are poor. Some organizations are creative in their charitable events, such as the case with Gateway Kia in Quakertown PA and the YMCA of Bucks County PA. This year, Gateway Kia collaborated with the YMCA on planning a memorable holiday moment. 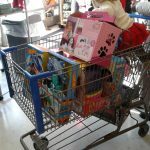 Together, they organized a Walmart Holiday Shopping Spree so local families could enjoy the true spirit of Christmas -the act of giving. 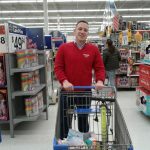 On Sunday, December 23, 2018, at 11:00 AM, in the Customer Service Area of the Walmart Super Center Quakertown, 195 N West End Blvd, Quakertown, PA 18951, Gateway Kia in Quakertown PA, donated a Holiday Shopping Spree to 11 needy families having approximately 27-30 children between them. The children selected their own gifts too! This is an amazing magical thing you are doing for our families at the Y! We are so grateful for your partnership and your incredible kindness this holiday season! 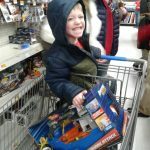 As you can see from the photographs, there were happy faces and filled shopping carts for making this Christmas a memorable event. The owners of Gateway Kia in Quakertown PA do care! They continuously participate in hosting events that demonstrate the value of community and the gift of charity. To help contribute, and strengthen the Quakertown and surrounding communities, please stop in and participate in our next event -in any way you can. If you watch television and enjoy the creativity of commercials, then you’ll love Kia’s new 2019 Forte commercial. It’s titled “Unruled” and has a Kia Forte commercial song playing in the background. Well, it’s not actually a song, it a musical piece -Ave Maria. The commercial guest-stars pro race car driver Collete Davis. In the commercial, Collete launches a newly-redesigned 2019 Kia Forte over another vehicle. That other vehicle is the Red Bull Kia Forte Drift-car. The advertising team at Kia Motors America filmed Collete Davis flying through the air in slow-motion and added a classical music track in the background -Ave Maria. You can watch the commercial below. The purpose of the commercial is to learn about the 8-inch touchscreen on the all-new 2019 Kia Forte compact car. You can watch Collete Davis put the touchscreen to the test while flying through the air. Kia’s claim at the end of the commercial is that it doesn’t have to make sense. Because it would take thousands of dollars and hours of CGI to make the 2019 Kia Forte compact car jump over a souped-up, not-for-sale version of itself, Kia had pro race car driver Collete Davis do it in one take. You can see the making of the commercial at the very bottom. In another commercial, one without the Kia Forte commercial song playing in the background, Kia has Collete Davis demonstrate the all-new 2019 Kia Forte’s available Smart Trunk feature. The commercial features the same absurdly powerful, not-for-sale Forte drift car. Kia then challenged Collete to a high-octane game of chicken in this versatile compact car. Again, it doesn’t have to make sense, you know, nothing crazy. Interested in learning more about the new Kia Forte? Call or visit Gateway Kia of Quakertown PA. Our qualified staff will answer any questions you have. They can also help you schedule a test drive here in the Philadelphia area. Come in and see what Kia owners love about the impressive 2019 Forte. 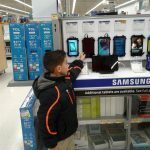 If you’re reading this blog, then you’re probably within a population of people who follow a daily routine. Your routine may be getting up at 6:00 AM and preparing your children for school. You may also make breakfast, lunch, and dress your children appropriately. But what if you couldn’t provide your children with the basic needs of shelter, food, or clothes? Think about this, the cold weather is breaking and your children don’t have a simple warm coat to protect them. This is difficult for some people to imagine, especially when their closet may have four or more winter coats. Year after year we hear how children living in poverty go without basic needs such as food and clothing. Yet, we never consider the magnitude of how the lack of basic needs can change a life. For example, a new winter coat provides more than protection from the elements. In fact, a winter coat supports a healthy mind as well as a healthy body. In an effort to facilitate keeping our children warm, Gateway Kia Quakertown and Gateway Kia Warrington stores maintain active memberships in The Auto Dealers CARing for Kids Foundation. Recently, staff from those stores participated in coat distribution. On Friday, October 19, 2018, Gateway Kia in Warrington and Gateway Kia in Quakertown both participated in the distribution of winter coats at the Upper Bucks County YMCA. For more information about the Auto Dealers CARing for Kids Foundation and the Driving Away the Cold program, please watch the video below or give us a call! If you’d like to make a personal donation, use this link to the More Than Auto Dealers website. The Auto Dealers CARing for Kids Foundation is the philanthropic arm of the Auto Dealers Association of Greater Philadelphia (ADAGP). The organization is distributing a record 51,696 brand-new winter coats to area children in need this month. Approximately 7,000 new coats will be distributed in Bucks County specifically. The effort is part of the eleventh annual Driving Away the Cold program, which involves nearly 180 local auto dealers teaming up for the greater good. One in six children in the Greater Philadelphia region lives in poverty and a warm winter coat is one of the essential items they often live without. This program aims to change that. Over the past years, people around the world recognize they have access to a new source of income. That source is you providing transportation to other people using your personal vehicle in exchange for a fee. Basically, you become an independent taxi-like service (ride-share services) regulated by a digital network. There are two main organizations that provide those networks, namely Uber and Lyft. The hook to tapping into this new source of income is drivers must have a vehicle qualified by Uber or Lyft. The good news is Gateway Kia in Quakertown PA inventories qualified vehicles for both Uber and Lyft ride-share services. If you’re thinking about driving for Uber and Lyft, then this blog will help you decide the best Kia model for each ride-share option. First, we found drivers in ride-share services can accumulate as much as 1,000 miles per week on their vehicles. If driving on weekdays only, then you could be totaling 200 miles per day. For that, we consider the obvious reliability, fuel efficiency, and safety. 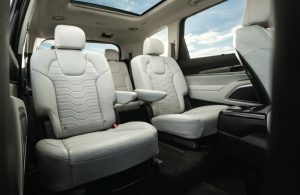 But, to get good passenger reviews and repeat business, you must consider passenger comfort (back-seat head and legroom, seat comfort, smoothness of ride, storage capacity). Our suggestions here cover all factors to help choose the best possible Kia model. To choose the best Kia model for Uber and Lyft ride-share services, you must know the class your vehicle fits into. For that, we’ll simplify our information by using Uber terms, which align easily with Lyft terms. So, let’s get started! UberX = Lyft: Sedan or larger vehicles valued from $15,000, this is the most popular class because passenger fare is the lowest. UberXL = Lyft Plus: SUV, Minivan, or larger valued from $20,000, higher fares and may be driven under UberX services. These vehicles also qualify for UberPool. UberBLACK = Lyft Lux: Mid to Full-sized luxury vehicles valued from $25,000, black interior and exterior, may be driven in lower services. UberSUV = Lyft SUV: Full-size SUV vehicles valued from $30,000, if black on black the SUV qualifies for UberBLACK, also may be driven in lower services. One thing to keep in mind, all UberSUVs (the highest fare) can be driven for all lower class services. So, if you are a pre-existing owner of a Full-sized SUV or planning to purchase one, then you have access to the maximum potential for earned revenue. If you have a Kia vehicle and don’t see it here, then please contact Uber or Lyft and ask if your model qualifies. Next, you need to know Uber minimum requirements in Pennsylvania. Your motor vehicle must meet all applicable inspection requirements and you must maintain a valid insurance policy. In the U.S., Uber maintains automobile liability insurance on behalf of its partners. In Philadelphia and the surrounding areas like Quakertown PA, the most popular Uber options are uberX, uberXL, and uberPOOL. Most newer cars qualify to drive in uberX class, which is the most popular option for riders because of its lower fares. The UberXL option requires your vehicle seat extra passengers and have a higher capacity. This helps you earn higher fares. The Kia models pre-qualified by Uber for uberX and uberPOOL, are the Kia Optima and Sorento. As you know the Optima is our stylish 4-door sedan, and the Sorento is our midsize SUV. Both have a perfect combination of comfort and reliability for your passengers. Same additional requirements as above except uberXL is limited to 7 factory-installed seats and seat belts. The Kia model pre-qualified by Uber for uberXL is the Kia Sorento. The Sorento is our midsize SUV with more interior capacity than most SUV classes and has very comfortable three-row seating. Now that we’ve covered the very basic requirements and the pre-qualified Kia models, check back to read our next blog on Uber and Lyft driver strategies. In that blog, we’ll share the differences between new, used, and precertified vehicles. Also, we’ll write about some best-kept secrets for optimizing your Uber and Lyft ride-share services. 2019 Kia Forte Review Exceeds Quakertown Expectations?